When Food, Inc. (buy it ) was released in 2009, it seemed to be an appropriate capstone to the decade of mass gastronomic enlightenment that preceded it. It feels like a blur: starting with the publication of Eric Schlosser's Fast Food Nation (buy it ) in 2001, the floodgates were thrown wide open for Michael Pollan's The Omnivore's Dilemma, the films King Corn and Super Size Me, etc. Though diverse in voice and angle, they all share the goal of exposing the cracks in the post-industrial culinary status quo. 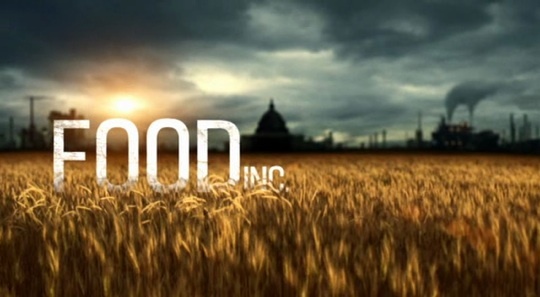 Food, Inc. treads similar ground, but focuses on the good, the bad, and the ugly of corporate agriculture, citing court cases against individual farmers, high-profile food poisoning cases, and the emergence of organic food in big box stores across the United States. Like many of its contemporaries, Food, Inc. is a documentary that presents an aggressive argument right at the outset, backing it up with anecdotes, talking head interviews, and the narrative guidance of superstar muckraker Michael Pollan. In order to further its argument, a documentary such as this needs to operate like a well-oiled machine, with its visual and narrative elements paired in the most persuasive combinations as possible. Nowhere is this requirement made more clear than in Food, Inc.'s opening sequence. The sequence begins with a montage of agrarian scenes: a sweeping view of crop fields, a rancher herding cattle, a red barn. The shots are tied together by Michael Pollan's narration, wherein he notes how the food that is produced today is detached from the common farmer, yet this fact is hidden by advertising which features "images of agrarian America." Curiously, Pollan's voice isn't identified by on-screen text. 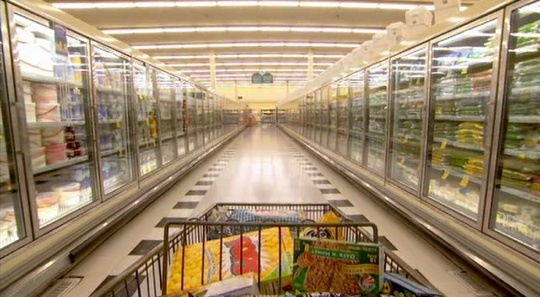 The scene progresses into slow camera pans across grocery store signage that nearly corresponds with Pollan's narration. As he mentions a "farmhouse" and "green grass," the camera focuses on labels that feature those elements. 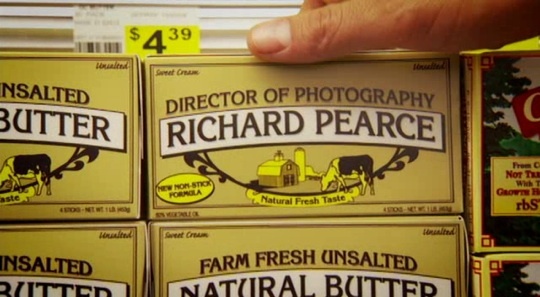 It soon becomes clear that this is a credits sequence as the first name — Richard Pearce, the director of photography — appears on a carton of butter. The narration continues to coordinate with the visual elements, illustrating various points that he makes regarding tomatoes, seasonality, and the absence of bones in the meat aisle. The camera moves at a consistent, ambling speed through the aisles, mimicking the gaze and pace of a casual grocery shopper. It's human nature to accept visual data as a confirmation of abstract ideas: it's the "I'll believe it when I see it" mantra. For documentarists, film can operate as the rubber stamp of approval or a repudiation of interview testimony. That way, a director may put his or her own editorial spin on the presumably decentralized arguments presented by a diverse set of interviewees. One of the interesting things about documentary films is the idea that they are more "truthful" than fiction films. In fact, this scene shows that, regardless of the point any given documentary is trying to make, they are just as manufactured and just as carefully coordinated as any romantic comedy or science fiction film. Similar editing techniques have been used to persuade audiences of pretty much everything under the sun: that 9/11 was an inside job, that penguins are monogamous, that McDonald's meals make Morgan Spurlock (of Super Size Me) sad... the list goes on. In Food, Inc., director Robert Kenner holds back his own audible voice, differentiating it from the voices of his interviewees by restricting himself to informational on-screen intertitles. His voice still comes through, however, in the editing. When the narration discusses how boneless meat epitomizes consumers' alienation from their food, the camera pans through a meat aisle that confirms his statement. By shooting the scene from a first-person perspective, he is planting the argument in the viewer — it is you who confirms the statements with your "own" eyes, not his. This contradicts later scenes and interviews that aim to analyze these issues with a balanced hand. With the editing of Food, Inc.'s very first scene, Kenner has established the viewpoint that he wishes for you to take. Well, yes, right. A filmmaker has a point of view. Editing is the grammar of film. Even in cinema verité, this is true. This was news to you? It's certainly not groundbreaking, but it is news to a lot of people who haven't studied film in an academic setting. So... did you like the film or not? I am left wondering since this seems to be a take on cinematic aspects rather than the actual content of the film. Honestly, I am a food person, not a film person. The tone of this "review" feels really out of place on this site, even if it's well written.